This study explores whether social enterprise business models, which charge food insecure individuals for donated food, offer a sustainable and dignified means of promoting food security, or simply perpetuate a neoliberal abdication of government responsibility. Demand for food via emergency food relief initiatives is growing strongly in Australia, with significant new demand from the individuals who might be regarded as the working poor. Frontline charitable organisations who obtain donated food and make it available for free via initiatives such as food pantries and soup kitchens, are struggling to meet surging demand at a time of retreating government support. The idea that these benevolent organisations might charge food insecure individuals for donated food is counter intuitive, to the point of being prohibited within relevant state based legislation. However, user pays models are gaining traction in countries such as Canada, the United Kingdom and France, both because they offer a funding stream to charitable agencies and because it is claimed they respect the dignity of food insecure individuals. 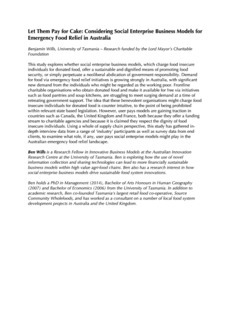 Using a whole of supply chain perspective, this study has gathered in-depth interview data from a range of ‘industry’ participants as well as survey data from end clients, to examine what role, if any, user pays social enterprise models might play in the Australian emergency food relief landscape.